A boy who had both legs amputated as a result of neglect by his birth parents was "failed by the system", his adoptive mother has said. 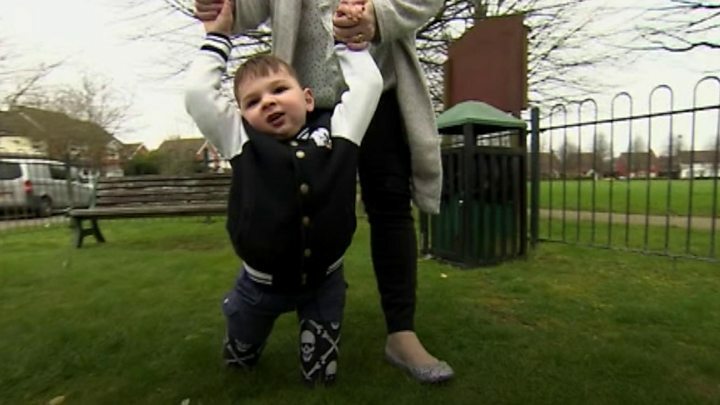 Tony Hudgell, from Kings Hill, Kent, was a five-week-old baby when he was injured so badly he lost both limbs. Paula Hudgell now wants an independent review of a serious case review by Kent's safeguarding children board. The review, published on Thursday, found there was no evidence professionals missed signs of abuse. Birth parents Jody Simpson, and Tony Smith, from Whitstable, who were convicted of causing the injuries, are serving 10-year jail terms. Mrs Hudgell said she believed facts had been omitted about Simpson's and Smith's histories. She also alleged there were unacceptable delays in assessments. "I still feel that Tony was very, very badly let down by the system," she said. Listing key events, the review said there was an "unexplained three-month delay" in referring the family to social workers. It found there was no evidence a pre-birth assessment was planned or carried out. The report, which described Tony Hudgell as "Child J", said while Smith was known to be on heroin replacement therapy, there was no evidence a risk assessment was undertaken with regard to his drug use. The report concluded: "There is currently no evidence that professionals in direct contact with the family missed signs of abuse to Child J. "It was only following the criminal trial that the full extent of the injuries and their impact on Child J was realised and made known." Independent chair of the Kent Safeguarding Children Board (KSCB) Gill Rigg said: "This is a tragic case, and the KSCB has thoroughly, independently and openly reviewed the circumstances." She said recommendations had been drawn up and the board would make sure action was taken.